A painting commissioned by Oxfam reminds people to purify their water before drinking it. Image by Meghan Dhaliwal. Haiti, 2012. 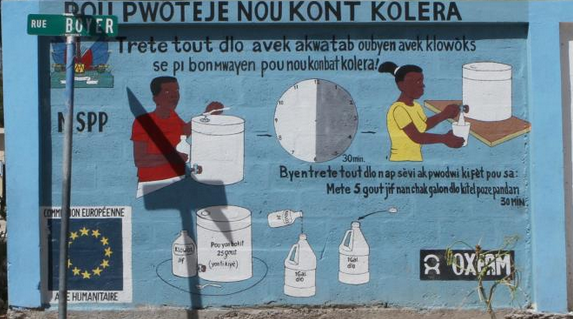 The first few times I visited Haiti, in 2012 and 2013, there were billboards, posters, and murals like the one above everywhere, urging Haitians to stand guard against the Vibrio cholerae bacteria that lurked in the water they used for drinking, washing, and cooking. Tiny bottles of hand sanitizer dangled from backpacks and belt-loops, and stood conspicuously in the middle of even the most modest restaurant tables. Today, almost exactly 5 years after cholera broke out in Haiti for the first time in recorded history, more than 9,000 people have died from the disease, and ReliefWeb reports that infection rates are up 147% from 2014. The guilty party: Vibrio cholerae O1, serotype Ogawa, biotype El Tor. How did this particular cholera biotype, the virulent El Tor strain that emerged in Indonesia in 1961, finally make its way to Haiti, which had been bypassed by all 6 of the major cholera pandemics of the 19th and 20th centuries? Do you remember the pig story I told you a few months ago? In that story, at a time of extreme political instability, a problem that didn’t exist motivated an international exercise in biological occupation, which in turn generated an astronomically expensive problem whose only solution was an indefinite quality of foreign inputs. This is a water story, but it reproduces the same formula, demonstrating occupation politics at a microbial scale. How did V. cholerae get to Haiti, what is it doing there, and why is it important to understand who bears responsibility for what the CDC calls the worst cholera outbreak in recent history? This entry was posted in Uncategorized and tagged aid, biopolitics, cholera on October 30, 2015 by sofmoore.